After you read this, you are going to think I am lying. You will probably Google all variations of “cupcakes made from pumpkin” hoping to prove that I am a little off my rocker. The only result will be that you will thank me. And never ever doubt me again :). That is right, these are cupcakes made from canned pumpkin. 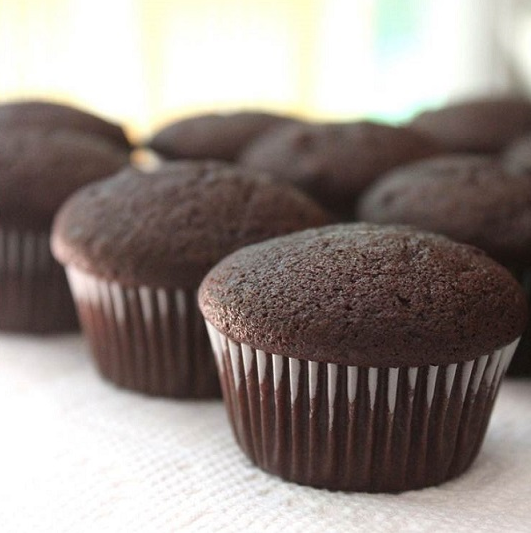 And, I don’t mean they are disgusting-tastes-like-healthy-cardboard cupcakes, but they are the FUDGE-IEST, RICHEST, CHOCOLATE-IEST cupcakes you have ever eaten. And they have two ingredients. I made them last year and ate the whole batch myself. Don’t forget to pin this one. It’s a keeper! Makes 12 regular or 36 mini cupcakes. Preheat the oven to 400 F degrees. Mix just the two ingredients together, ignoring the instructions on the cake mix. Stir in the mini semisweet chocolate chips, if using. (If you lick the spoon, please note that the batter might taste a little pumpkin-y. Don’t worry..it will be gone by the time you bake them). Spoon batter into the lined or greased tins. Bake at 400 degrees until a toothpick inserted in the center comes out clean, about 20 minutes for cupcakes and 12 minutes for the mini-cupcakes. Remove from the oven and cool. I think these are better as mini’s – but both are amazing! Head over to Cropped Stories for an AWESOME giveaway! A few girls and I are going to make someone rich!